Wish you had a bigger living room? As one of the most-used rooms in the home for relaxing, it’s understandable that you’d want a larger living space. Creating an open, airier feel to your home isn’t as difficult as you might think, and there are ways to trick your brain into thinking your living room looks larger. 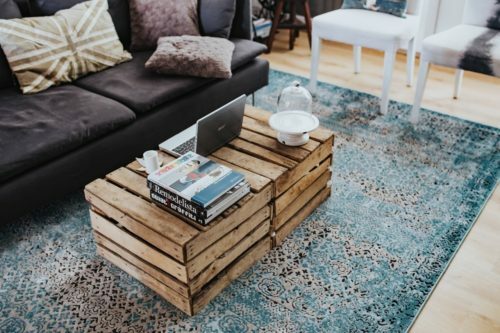 There are different approaches you can try to enhance the look of your living room, so get started with some of the tips below. Dark rooms with a lack of natural light can make a room feel much more enclosed than a lighter room. Lighter colour palettes have been used in interiors for years to make them look bigger and brighter, and is a simple and affordable trick you can use in your own home. White interiors are particularly popular at the moment, but you can also try using light pastels like blues, yellows, pinks and greys to create the same effect. Try to make the most of natural light in your living room. Instead of using heavy blinds or blackout curtains, opt for lighter touches that will enable the light to come in much easier. Choosing made to measure sheer curtains is a great idea for when you want some privacy during the day or evening, but won’t affect the light coming in Try to keep your curtains open as much as possible to brighten your home, and consider expanding your windows if you’re currently restricted by the amount of available light. Never underestimate the power of a good decluttering. Decluttering your home can get rid of unwanted items that are taking up space, making your home look messy and cluttered. Decluttering your house from top to bottom will free up space to allow you to put things away easier, creating a more minimal look that is more open and makes a room appear larger. Decluttering should be something that you do often to ensure your home doesn’t retain unwanted junk, but remember to donate and recycle where possible to stop items going to waste unnecessarily. The layout of your living room can make a big difference to how big or small it looks. With the right living room layout, you can create more space in the centre of your room – instantly making it feel bigger. Try to keep larger furniture items against the wall and keep shelving to one corner or one wall so that the wall space also remains uncluttered. It might take you a few attempts to decide on the right layout, but you can make it work to find a style that suits you. After creating the perfect living room, what’s next for your home? If it’s a new bedroom you’re looking for, then some budget-friendly ways to decorate a bedroom could be useful. Creating the illusion of larger spaces can help you make the most of your home, so look at ways to transform yours and enjoy having a bigger, brighter space without having to move!